Located in Lucknow, a well-known bode of the elite of Awadh, Kothi Nur Baksh was erected at the command of Nawab Saadat Ali Khan, which was occupied by his son Sadiq Ali Khan. 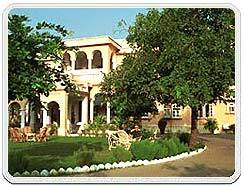 Later, in the time of Nawab Ghazi-ud-din Haider, his wazir, Aghamir acquired it as his residence. In 1837 when Mohammad Ali Shah became the leader of Awadh, Kothi Nur Baksh was handed to his son Mirza Rafiussan. Nur Baksh Kothi is one of the few buildings of the age where the earliest authentic emblem of the rulers of Awadh can be seen in marble.